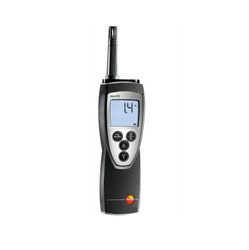 - Measures moisture in air or gas samples with positive pressure. - Accurately calibrated and ready for use. - A guaranteed accuracy better than one p.p.m. moisture in dry air. - Intrinsically safe as standard. - Sensor:electronic capacitance polymer film. - Condensation will not affect meter's accuracy. - Data Hold freezes reading. - Thermometer, hygrometer is designed for direct measurement of temperature, relative humidity for compressed air up to 25 bars with 1m cable. - Audio and optical alarm of measured values. - Memory of minimum and maximum measured values. Dual LCD displayThe maximum value on the primary display is 1999. The maximum value on secondary display is 9999.